Heatseal jaw design is relatively simple. It is made even easier by the use of TOSS® components that are available to facilitate the construction. Good sealing depends upon equal and even contact between the jaws for the full length of the jaws. This means that the jaw bars must be straight and evenly loaded to avoid bowing of the jaws during the sealing process. When building long jaws, it may be necessary to utilize a supplementary bar as a stiffening back-up member. Sealing is accomplished when the seal area cools, therefore, the ability of the jaw bar to absorb heat is important (See STEP 3. Modes of Sealing). Aluminum is usually used in Heatseal Bars because it has a high specific heat and thermal conductivity as well as being light and easy to machine. Jaw Bars offered TOSS by include a cooling passage for the full length of the jaw bar. In most cases it is not needed, but additional cooling can shorten the cycle time by one or more seconds. This time saving can be very important in high speed production. TOSS supplies custom made Heatseal Jaw Bars which include Jaw End Blocks for attaching the Heatseal Band to the bar. Heatseal Jaw End Kits are also available for making ones own jaw bar assemblies. These kits contain the jaw end tension blocks together with the springs, spring plungers, attaching swing bolts, and installation instructions. The force required to effect a good seal or cut is a function of the material composition, the band shape, the hardness of the underlayment back-up material, the hardness and thickness of the elastomeric pad on the opposite jaw, and the desired result. The optimum force required can only be determined empirically and optimum results can only be attained by testing. As a starting point, one should set-up using a minimum unit force equal to 50#/sq.in. of Heatseal Band surface. More force may be needed to get a clean cut on hard materials or non-woven fabrics and less might be desirable on delicate materials. Heatseal Bands expand when they are heated; therefore, a means must be provided to take up the slack or the Heatseal Band will buckle and break prematurely. The Heatseal Band is also an electrical conductor so the band must be electrically insulated from the bar. 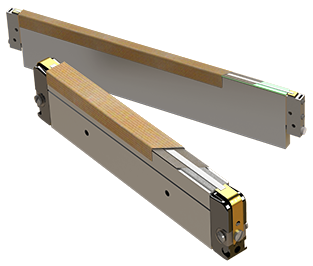 The bar must, therefore, be fitted with end connector blocks that can provide tension on the band and remain electrically insulated. 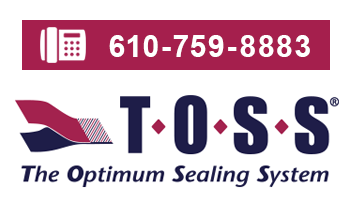 TOSS offers several different Jaw End Kits for Heatseal Bands and cut wires that can be conveniently mounted on the ends of the jaw bars to serve this function. TOSS Jaw End Kits are designed to fit on to the ends of 3/4" x 2" or larger bars. This is usually a convenient cross-section for jaw bars and it provides a reasonable amount of heatsink capacity for most applications. The face of the jaw bar must also be electrically insulated. This can be done with a variety of materials. The most convenient of these materials are PTFE Tape, Durit, and Siglaha that are available from TOSS with self adhesive backing to facilitate attachment. The proper selection is a function of the sealing mode (See STEP 5. Back-Up Materials, for more information). The jaw bar that opposes the Heatseal Band can also be fitted with a Heatseal Band or not, usually not. Either way, the opposing jaw is usually faced with a silicone rubber strip that is covered with PTFE tape. It is important to have a resilient component on one of the two jaw bar faces in order to absorb the shock of fast closing jaws and to provide some forgiveness and compensate for minor misalignment or distortion of the bars. To cool or not to cool, this is sometimes the question. Some systems use water-cooled jaws as a means of maintaining the jaw at a relatively constant temperature. These systems then, may demand an excessive amount of energy to overcome the heat loss into the cooled jaw. When water chillers are utilized, excessive cooling is often the case. Cooling below the dew point will result in undesirable moisture condensation on the jaws, particularly in humid environments. When doing impulse sealing at high speeds, 50-60 or more seals per minute, cooling of the Heatseal Jaws can be helpful in accelerating the cooling cycle. This reduces the time required for the seal to set and permits operation at higher speeds. Some polymeric materials, like polypropylene, may become embritteled when cooled too rapidly. It is, therefore, important to know the character of the film before developing a processing protocol for sealing it. The skillful use of water that is temperature controlled can be a valuable aid when the investment is justified by greater productivity. A cooling passage is included in TOSS Heatseal Jaw Bars as a standard feature. It is there if it is needed. In any event, if one elects to use cooling water, it is imperative that the Heatseal Jaw not be over-cooled. A carefully calculated balance must be maintained between the time required to heat the seal and the time required to cool it. Care must be exercised to maintain the jaw temperature above the dew point of the environment or condensation will collect on the jaw and cause electrical leakage and corrosion. Air cooling is occasionally employed to accelerate the cooling of the heatsealed material. This technique is more often utilized to cool seals that have been made by the constant heat mode. Some applications require two or more Heatseal Bands physically mounted in parallel on either one or both jaws. Using Heatseal Bands on both jaws may be useful in the case of sealing thick or multiple layers of materials that can be sealed more effectively with heat from both sides. More than one band can often be powered by one controller/transformer set. This can be done as long as the total power requirement of the combination does not exceed the ­capacity of the controller (See STEP 9. Temperature Controller Selection). If more than one band is mounted in parallel on a single jaw, it is imperative that each band be mounted to individual Jaw End Blocks so that each Heatseal Band will be individually tensioned. In addition, if two or more Heatseal Bands are mounted physically in parallel, it is best if they are also wired electrically in parallel. When done correctly, the electrical potential (voltage) at any point along the length of the one Heatseal Band will be the same as the potential at the corresponding point on the second band. Then, if the bands come in contact with each other, no damage will be done. The situation is the same in the case of Heatseal Bands that are mounted on opposing jaws. A typical application for this is where it is necessary to seal the top of a plastic pouch with a conventional seal and concurrently make a second seal/cut to remove excess material from the top of the pouch. In this instance, a TOSS Tapered Band can be mounted in parallel with a TOSS Cutting Band of equal length and cross-section. The bands are then wired in parallel and energized by a single control system. The heat can be adjusted to provide a perfect seal with the Tapered Band. The Cutting Band, by its nature, can be designed to run slightly hotter and, therefore, effect a cutting action. Cutting may not work too well on composite structures depending upon the character of the composition. Again, it is always well to be knowledgeable about the structure and the sealability of plastic films before proceeding to process them.